SharkBite's End Caps are push-to-connect and are the easiest way to cap off your Copper, PEX, CPVC, or PE-RT pipe lines. There is no soldering, clamps, unions or glue required. These fittings are great for stub outs and pressure testing a home as they take no time to cure. They are easily removed with a Disconnect Clip. 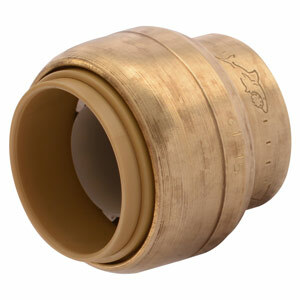 All SharkBite fittings are capable of being installed on either wet or dry pipe. This product is rated for up to 200 PSI and 200°F.